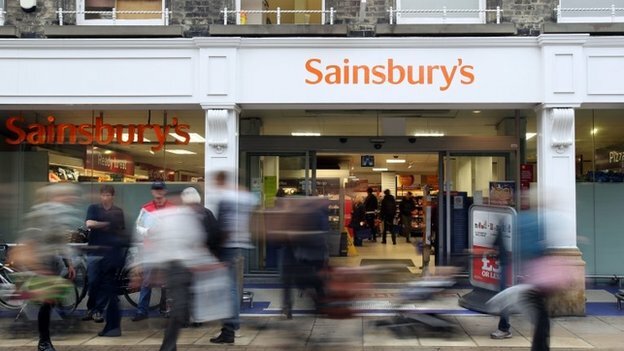 Supermarket chain Sainsbury's has reported a second consecutive quarter of falling sales as it faces increasing competition from discount rivals. It said like-for-like sales, which strip out trading at new stores, excluding fuel, in the 12 weeks to 7 June were 1.1% lower compared with a year earlier. In March, Sainsbury's reported its first fall in sales for nine years. Chief executive Justin King is stepping down in July after 10 years. He will be succeeded by Mike Coupe, Sainsbury's group commercial director. Mr King said the supermarket had continued to invest in reducing prices and improving quality in a "challenging market". He said: "Lower food price inflation and reduced fuel prices are a welcome respite to customers' finances, but they continue to spend cautiously, leading to industry growth in the quarter being the slowest in a decade." Total sales for the quarter, excluding fuel, rose by 1%, and Sainsbury's added it was confident it would outperform its rivals this year. The supermarket's share price rose 2% to 337p in early trade on the London Stock Exchange. Richard Hunter, head of equities at Hargreaves Lansdown Stockbrokers, said the fall in like-for-like sales was "largely as expected and set against sluggish industry growth". He added: "More positively, Sainsbury's online and convenience offerings are becoming an increasingly important and recognised part of the business, whilst the company continues to offer differentiation on factors other than price." In May, Sainsbury's reported a 16.3% rise in annual pre-tax profits to £898m, but also warned of "challenging" times ahead. The big four supermarkets - Tesco, Sainsbury's, Asda and Morrisons - are being squeezed by low-cost rivals such as Aldi and Lidl, as well as upmarket chains such as Waitrose. They have responded by cutting prices on essential items including bread, milk and eggs, in an attempt to stem the loss of customers to the low-cost chains. In May, Mr King told the BBC: "There's always a price war in supermarket retailing. Occasional skirmishes break out, I guess this is one of them." "In the end, it isn't just about price. Quality, the provenance of sourcing is a big factor as well." Sainsbury's rival Tesco recently reported a third consecutive quarter of falling UK sales. For the three months to 24 May, the supermarket said like-for-like UK sales including VAT and excluding petrol fell by 3.7%. Chief executive Philip Clarke said trading would remain challenging "throughout the coming quarters". On Tuesday, figures from the British Retail Consortium (BRC) found average food sales on a quarter-on-quarter basis slipped 0.2%, as the major supermarkets cut prices to hold market share and fight off competition from their discount rivals.